When Rachel Rushing of Full of Italy proposed a blogger exchange, I was immediately game. Well, that’s not 100% true. My very first reaction was, “Can this work? I can actually receive something in the mail that’s not from Amazon, when it’s not even my birthday?” But of course I could. See, as a translator, wine/travel writer, and blogger, huge chunks of my day are spent online, in front of the virtual world that is my computer. So to step outside of the world we create for ourselves within our computers—those of us who write or work online, especially—was a breath of fresh air. It’s just plain nice to connect with someone on a more realistic level, and the fact that this was possible through our online connection made it that much more satisfying. So after that first reaction, yes, I was immediately game. Rachel, an American living in Friuli-Venezia Giulia region, had this great idea of exchanging artisan products from our respective regions, complete with a quick, hand-written note inside, to build a tangible connection that also lets us enjoy what small-time producers throughout the boot are making. Check out her post here to read about her side of the blogger exchange, where you’ll also find her well-stated objectives for beginning it. Rachel sent me freshly ground coffee from Grosmi, a local business in Friuli-Venezia Giulia that has been operating since 1958; and I sent Rachel a bag of semi-whole grain Maratelli rice from Cascina Canta in the Novara area, or “Novarese,” a heritage variety that is only grown by this rice farmer (read more about the rice and farmer here). The Grosmi caffè arrived just three days after Rachel sent it via GLS. I opened it up and was greeted with that heavenly aroma of a dark roast, and I made some caffè in my little moka immediately. With a slice of cake on the side (because I always have cake on hand, and if I don’t, I have cookies), it was the perfect afternoon snack. My caffè preferences tend towards Illy, Vergnano, and Lavazza (in that order), and I’d place Grosmì at the level of Illy—but I have to say it’s hard to compare the two, because the flavor was quite different. I usually buy medium roast Illy, and Grosmi was dark. It had an intense, rich flavor, but not overbearingly bracing and not at all acidic, which is something I’ve noticed in lesser-quality dark coffee grounds. I guess it’s easy to over-roast and push the flavors and aromas beyond their optimal point. But this caffè was excellent. I’d like to order another bag and do a taste test, side-by-side with Illy and with the same type of roast. 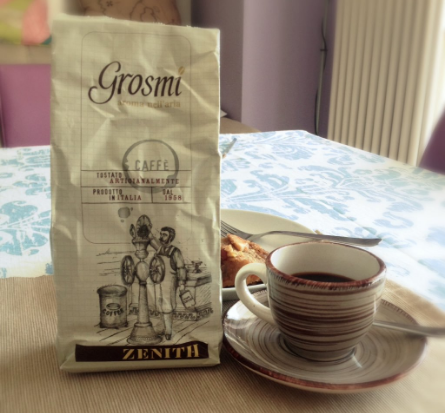 If there was a sales point near Turin, I’d definitely keep Grosmi caffè on hand. They do have an e-store, but they seem to be selling just some of their products (and one 250 gr bag of Arabic coffee costs €42! For the true connoisseur…). As for the idea of an exchange, I would love to keep this up. It’s so fun to receive tasty things in the mail! And Amazon doesn’t give you a little hand-written note. I liked how Rachel chose a product to send me, and I chose for her; this way, it feels more like an exchange rather than a shopping experience. But I can also see how selecting products would be preferable, for future exchangers. In fact, we haven’t established how this blogger exchange will work on a bigger scale yet. Sending the rice via the Italian Posta, by the way, took a little over a week to arrive and cost more than twice the rice itself. Totally worth it for this exchange, but I wouldn’t want to do that for a dozen different ones in the future. If you have logistical ideas, they are welcome! Please head over to Rachel’s blog, Full of Italy, where she enjoys connecting with Italy lovers and bloggers by sharing stories about her expat experiences and introducing her readers to Friuli’s hidden treasures. Much like our blogger exchange has done! Exactly. I finished it in just 2 weeks! Nice, it also points out how food and food products can be so regionalized in Italy. Good idea. Exactly. That’s something that you never truly understand or appreciate until living in Italy, even if guidebooks say it. Rachel had a really good idea. If I ever get to Friuli Venezia Giulia (was supposed to go a few years ago but had to cancel due to Luca and I both catching a stomach flu the day we were supposed to leave!) I’ll look out for Grosmi coffee. We have smilar tastes in coffee by the way. I tend to Vergnano or Lavazza (and when Luca doesn’t complain about the price! ), Illy. I’ve been inspired to travel to Friuli, now–I’ve never been either. Illy is definitely the way to go when you feel like paying extra. They also have excellent customer service, which makes me like them even more. My name is Debra and I’m new to your blog and enjoying it immensely.